There has been a fortification were Cardiff castle now stand since sometime during the 3rd century when a Roman fort was built here. In the late 11th century a motte and bailey castle was built here and then finally the earliest parts of the stone castle which can be seen today was built in the 12th century. 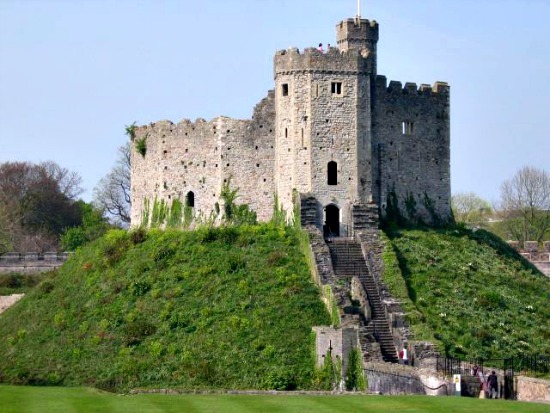 The castle has seen a lot of violence in its life, as many castle have, with it being attacked several times and was even stormed by the forces of Owain Glyndwr in 1404. During the English Civil War Cardiff Castle was initially taken by a parliamentary force, but was regained by Royalist supporters in 1645. When fighting broke out again in 1648, a Royalist army attacked Cardiff in a bid to regain the castle, leading to the battle of St Fagans just outside the city. Cardiff Castle escaped potential destruction by Parliament after the war and was instead garrisoned to protect against a possible Scottish invasion. After this the castles military importance declined and the castle changed hands a number of times as a personal residence for various families. The last private owner of the castle died in 1947 the castle was given to the city of Cardiff and is open today as a tourist attraction. The castle is thought to be haunted throughout, with no particular hot spot for the paranormal activity. One particularly interesting tale from the castle is that of ghostly horse and carriage, which people have claimed to have seen driving up Cowbridge road east to the gates of the castle, with some people claiming they have even seen it within the castle walls. The stockroom is also home to poltergeist activity, with items within the room being moved round or even thrown from one side to another right in-front of staff. People have also claimed to have seen a face-less apparition within this room which appears as a grayish mist in the shape of a person but with no facial features. The dinging hall also has an interesting story behind it which occurs at 3:45am every morning. The heavy oak doors leading into the room are said to fly open, as if someone of great strength has just barged through them, even if the doors are locked. This is most likely just a camp fire story though as visitors to the castle are not allowed inside at such a time and this story would also be very easy to prove one way or another. The only identified ghost at the castle is thought to be that of the 2nd Marquess of Bute who died in 1848. He is said to start in the library and then walk through several walls including passing straight through the chapel to a joining room were he is said to have died. He has been described as being a tall shadowy figure wearing a long red tinted cloak. As for other paranormal activity at the castle there are all the usual bumps and knocks and whispers from empty areas but I've generally found that any place which is said to be haunted will have someone at some point make these types of usual claims.